And because it was home cooking, I tend to make it a healthier dish for my family, so as to save some cooking oil, as I do not like to keep the used cooking oil for cooking more than one time. So, instead of deep-frying the pork chops, I chose to shallow-fry them. It will still be crisped, but I had to fry only one side of the chop at a time as the oil in the pan will not be enough to submerge the entire piece. Just make sure that the chop is not too thick, and shallow frying method will be as good to make the dish a success. 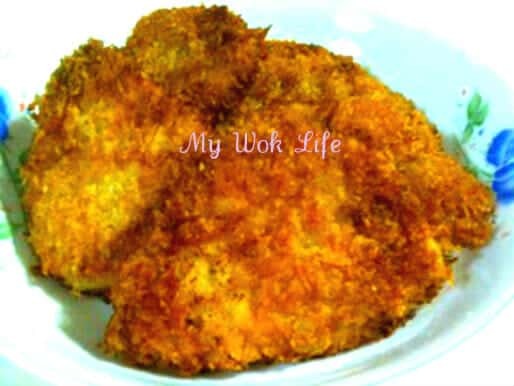 Yes, don’t forget to serve this savory chops with the easy ready-made Japanese curry sauce! 1) Marinate pork chops with the listed seasoning for overnight or at least 1 hour. 2) Pat some potato starch on both sides of each chop. Then, dip the lightly floured chop into egg solution till both sides are well coated with egg, followed by breadcrumbs completely covering both sides. Repeat step for the remaining chops. 4) Remove from pan and drain on kitchen towel. Cut crisped pork chops into thick stripes. Pour heated curry sauce with vegetables on the pork chops or serve separately. Serve with steamed Japanese rice and cherry tomatoes immediately, or prepare them in lunch box. A serving of my Japanese curry pork chop rice (with two pieces of chop) counts about 550kcal. For more options: Change the option of gravy by serving the pork chops with Thai chili sauce, BBQ sauce. Or simply enjoy it plainly without any gravy. And for this, you might wish to melt some butter (about 1 tablespoon for each frying) into the heated pan before frying the chops, to make it more aromatic with a touch of buttery flavour. As such, you may even reduce the amount of olive oil which used to heat pan, to prevent extra loads of oil intake, you see. Tips: Shallow fry is too enough for cooking crisped chops. Just don’t slice the chops too thickly. I think 2cm thickness is good. * Get Japanese curry sauce off the shelves. It comes in nice squarish box, with different options of with or without vegetables, and in apple or original flavour. Each packet ranges from S$4.10 – $5.80, and could be found at the Japanese product cells at major supermarkets. * Serve cut pork chops for more convenient bite, especially for lunch box where most of the time you will be digging in with the disposable plastic cutlery or just a single spoon or pair of chopsticks. 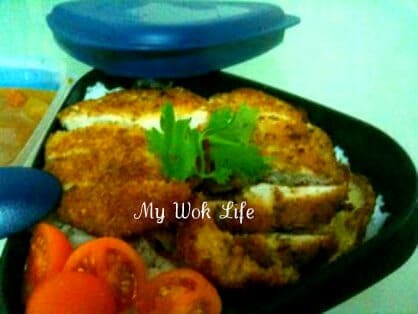 * For lunch box meal, I reckon packing the curry sauce in separate container, since it will not be consumed immediately. This may prevent the chops turning soggy after one whole morning wait. Reheating of 1 minutes required before consume.